Los Angeles outfit The Neighbourhood announce June & July tour dates following their debut appearance at Central Park’s Summerstage on May 20th, 2014. Supports acts for The El Tour Blanco will be Danny Brown, Travis Scott, 100s & White Arrows. The band will embark on their summer tour beginning on June 21 in Vancouver and running through July. During the band’s worldwide tour, they unveiled new single “Honest,” part of The Amazing Spider-Man 2 Original Motion Picture Soundtrack (out April 22). You can listen to the track HERE and watch the accompanying Lyric video . The film’s epic score was composed by Oscar®- and Grammy-winning composer Hans Zimmer and The Magnificent Six. Three tracks are available now, listen at Live Mixtapes. 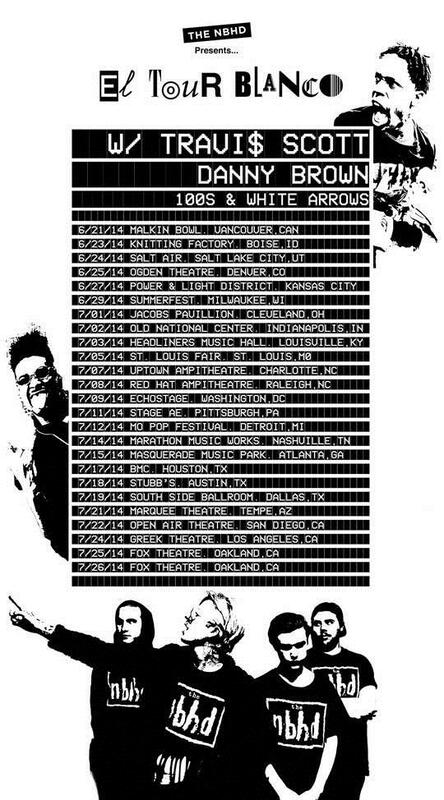 Catch The Neighbourhood on tour. Posted on May 7, 2014, in News and tagged 100, danny brown, el tour blanco, jesse rutherford, neighbourhood, sweater weather, travis scott, white arrows. Bookmark the permalink. Leave a comment.